Our host for the trip was Rob Sivulka. He runs Mormoninfo.org and does full-time ministry in Salt Lake. 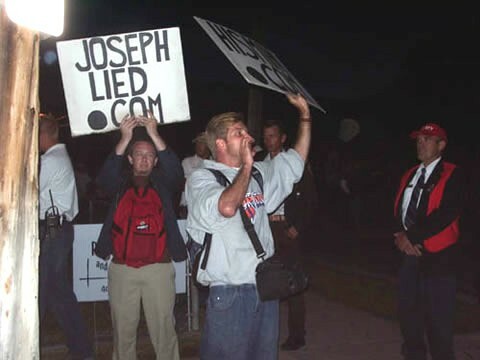 What defines Rob, aside from knowing just about everything and being a cool surfer-dude, is that he often carries around signs in front of the Temple and at the Pageant advertising his site and Josephlied.com. Needless to say, this usually doesn't generate a lot of love and support. When I first saw him doing his thing I was hesitant. I didn't think it was the best way of going about witnessing, but then he does do this for a living. After seeing many of the dirty looks and anger that the signs stirred up I decided I didn't want to have anything to do with it. Rob was a great guy, as long as he stood a good way away from were I was witnessing. Something changed in me though through all of our training on Mormonism and through watching the Pageant. I saw Mormonism for what it is and became more determined than ever and willing to do anything to get people out of it. We had been passing out tracts defining the differences between Mormonism and Christianity. That hadn't been working for me, it wasn't enough to let people know that Mormonism just doesn't cut it. Our last night at Manti Rob needed help. About 40 minutes before the Pageant begins he starts marching around and yelling at the top of his lungs why people need to leave Mormonism. He needed another person to follow him with a sign, and I did it. The first major thing that God did in me from the trip was boldness. Unfortunately I haven't been bold in my faith in non-Christian situations. That final night I stepped up to the plate to stand beside a man exploiting the flaws of Mormonism. We were cursed at, hassled, mocked, laughed at, etc., but I know that some of the things Rob said put a stone in people's shoes that won't go away. Next time I hope to go with signs of my own. The second major work God did in me was realized in the midst of that boldness. I began to see people the way I believe God sees them. Overwhelmed with grief at their idolatry and sinfulness. They were blind to their flawed religion, and my heart broke for them. After we had finished marching and we were leaving I couldn't help but weep for them. I wanted so much for them to know the one true God, I would have done anything. That perspective is one that I pray I will never lose. It will sharpen my boldness when I need it most, and I believe I've been shaped into a better ambassador for Christ through that. I'm well aware of the changes in me, but I was also greatly encouraged by the students. I don't know that I've seen high school students more transformed by a mission experience in any other setting. There's something about being on the front lines with real people who need salvation that I believe makes us better Christians. At this point I cannot be grateful enough for being able to be a part of the team. And I'm more grateful as well for my salvation in Christ by grace through faith. A faith that I now have even greater assurance of.